Located on the western coast 120 km north of Majunga, Anjajavy is both an inaccessible fishing village for those who are unaware of it and an extraordinary peninsula at the end of the world. 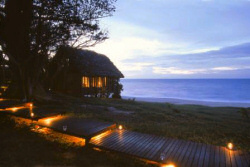 Set along the Mozambique Channel in an extremely diverse environment where flora and fauna offer a perfect reflection of Malagasy nature, the hotel comprises an outstanding complex of 25 rosewood villas facing the sea. 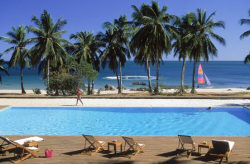 Anjajavy Hotel, is ranked by European standards as a Four-Star plus establishment and is ideal for the demanding eco-tourist. The 450-ha nature reserve alongside the hotel is home to over 1,800 floral species, most of which are endemic to the country along with many medicinal plants. 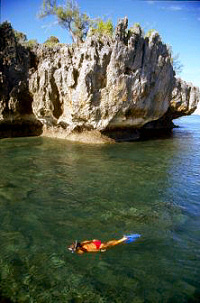 Tsingy, the celebrated millennial coral remains can be found throughout the forest and overlooking the bay. The forest is also home to many animal species such as the famous Sifaka lemur (Verreau’s propithecus), the bird of paradise, chameleon and Cuvier’s oplure (a type of iguana)… The Madagascar fisher eagle takes to the sea and the coral reef, a magical combination of shapes and colours in a world of silence that remains untouched. There is no road to Anjajavy. Anjajavy lies in the heart of the Menabe Sakalava territory. There are only barely signposted paths through the bush and forest. 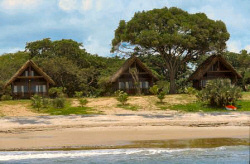 Anjajavy can be accessed by plane from the private airline Air Hotel from Antananarivo or Nosy Be. After a flight offering magnificent low altitude vistas of all the scenery offered by the Ile rouge, you will land on a private runway on the Anjajavy peninsula. An extraordinary change of scenery is guaranteed as soon as you take off! 90 minutes form Antananarivo/ Ivato airport. 75 minutes from Nosy Be airport. Each villa features a large terrace overlooking the sea, a living room area and breakfast area and a bed room. A small staircase provides access to the first floor which features a relaxation room that can be used as an office or children’s/guest room. The bathroom boasts a vast bath with separate lavatories. Your room is maintained at the ideal temperature for you by an individual and silent air conditioning system. Thanks to his skill in fine cuisine, your chef will surprise you with an international menu of fresh produce with just of touch of Malagasy specialties. A 200 sq.m. overflowing swimming pool faces the sea. The oasis is a completely unique location that Anjajavy Hotel is very proud of. Designed by Camille MULLER, a well known Parisian landscape designer who also has a deep love for Madagascar, the oasis is the result of the search for harmony through all the essences to be found in this immense country. A grid of vaporisers maintains a constant humidity level and offers a genuinely satisfying feeling of freshness during the hot hours. The boutique boasts a wide range of Malagasy homecrafts and beach articles. Satellite telephone available on request from reception using the telephone in your villa. Optional e-mail and fax transmission. Satellite television available at the bar. Walks are open to everyone and do not require any physical aptitude. Signposted paths from the hotel will lead you to the forest, surrounding bays and fishermen’s villages. Naci, the gardens and nature park manager, will accompany you if requested along your walks. Through tsingy covered forest to discover the principal endemic species of Malagasy flora and fauna. Discovering baobabs, the hairy crab, concretions and birds, ending with a tour of a small cave. By means of an off-road vehicle and then on foot to discover the underground world of stalagmites and stalactites and its denizens, the roussettinsis madagascariensis. 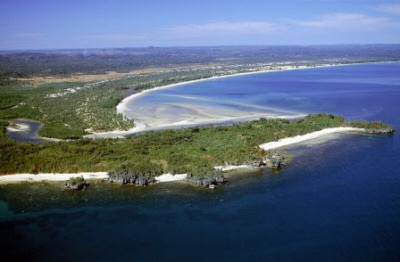 Tour the Anjajavy peninsula along its wild, untouched bays. A Robinson Crusoe day with a picnic on one of the beaches where no one will disturb your privacy. Every Sunday morning under the village mango tree is market day in the small fishermen’s village of Anjajavy. Sail in by motorboat or catamaran or by SUV to meet the villagers. By motorboat or canoe, visit the dispensary and primary school established by the Ecole du monde NGO, as well as the craft shop set up by the Association des Amis d'Anjajavy. You can take part in the village’s development and help the local populace by purchasing Malagasy handicrafts made on site by the villagers. The aim of this charity is to open the hotel out to its environment by promoting and helping the development of economic micro-relations based on its business. The two surrounding villages of Anjajavy and Ambondro-Ampassy are the main recipients although the other nearby villages of Antsagabé, Tsaramandroso and Ambodirano are concerned. A proverb by Mao illustrates the charity’s founding principle: " Give a man a fish and he’ll eat it today… Teach him to fish and he ’ll eat all his life ". The local populace receive help in the form of technical support and loans at very low rates which must be repaid over quite a short term. The charity operates in highly diverse fields: fishing (purchasing canoes, nets, fish drying equipment), agriculture (purchase of zebus, grain, fertiliser), bee keeping (hives), livestock, handicrafts, shops and transportation (purchase of dhows for trade with Majunga). The charity is financed in part from donations from friends and relations and in part by Anjajavy Hotel. 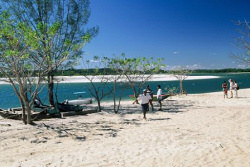 Madagascar’s western coast enjoys sunshine practically all year round. In February, tropical rains reinvigorate the greenery. Anti-malarial treatment is strongly recommended. A valid passport with an expiry date at least six months after your return date.